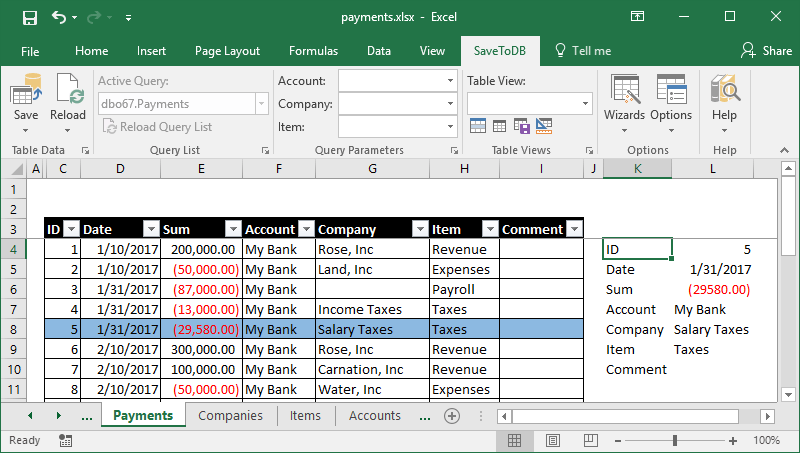 This e-book shows how to create feature-rich database client applications using Microsoft Excel. 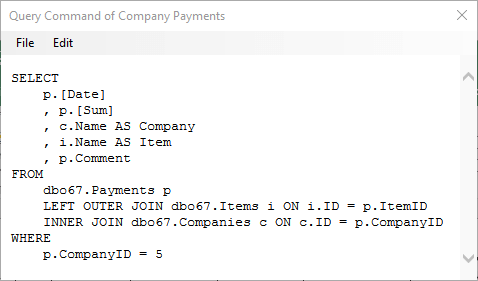 As a database developer, you may create such applications with the SaveToDB add-in using SQL knowledge only. 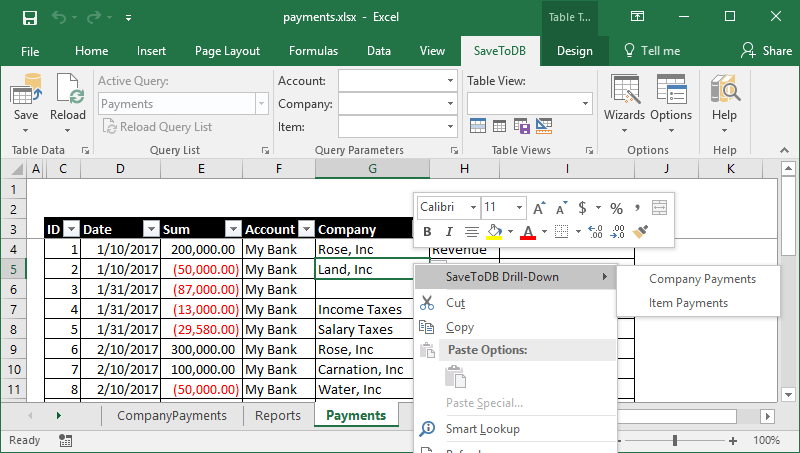 The SaveToDB add-in allows creating database client applications using Microsoft Excel. 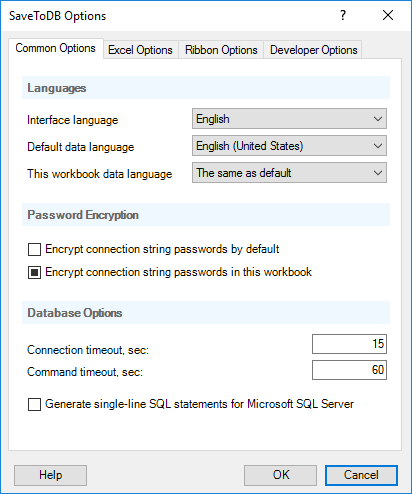 Moreover, application features are being configured in a database and extended using SQL. So, using the add-in is the best choice to create client applications for database developers. As a database developer, you may apply your current skills to create amazing Excel applications. I believe we help developers realize their potentials, build a successful career and make users happy. In this book, we start with a new Excel workbook and finish with a ready-to-use application. You have to download and install the SaveToDB add-in, version 7.2 or higher, at www.savetodb.com. All features described in this book are available in the free SaveToDB Express edition. This book contains an example database for Microsoft SQL Server hosted in Microsoft SQL Azure Database. You may also use Oracle Database, IBM DB2, MySQL, PostgreSQL, and others. The steps remain the same. 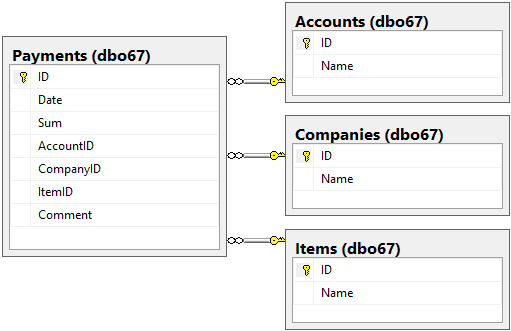 The database objects belong to the dbo67 schema. We have three master tables and the dbo67.Payments table with foreign keys. The dbo67.viewPayments view and dbo67.uspPayments stored procedure select data from the Payments table. You may find a complete source code with comments and download links in Appendix 1. Let&apos;s create a new workbook and save it as payments.xlsx. 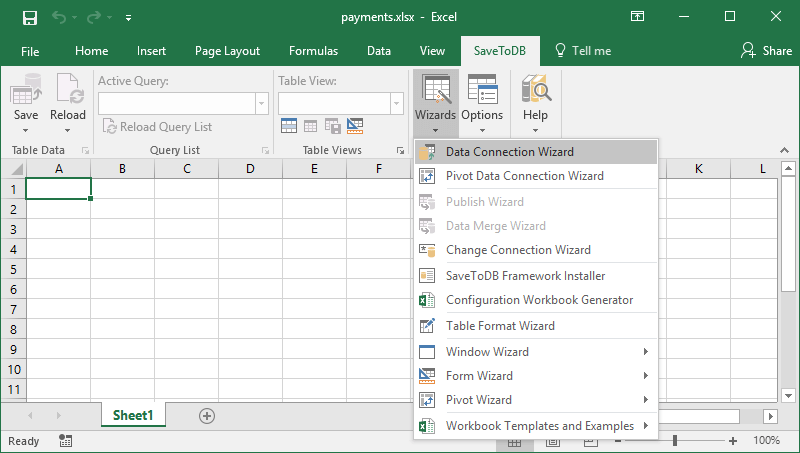 Then let&apos;s run the Data Connect Wizard and connect to the Companies table. Follow wizard steps. At the following screen, uncheck Enable Query List on the ribbon. Insert a table at cell B3. We may edit data, add and delete rows. Then just click the Save button to save changes. Click on a table. Select the Design tab. Select the desired design in the Table Styles gallery. I prefer White, Table Style Medium 15. Right click on the selected design and click Set as Default. 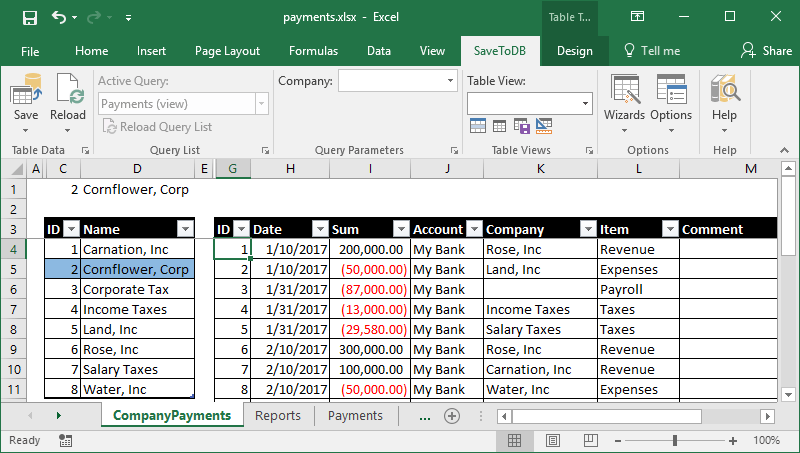 Uncheck Bunded Rows in the Table Style Options group. Select the View tab. Uncheck Gridlines in the Show group. Select cell A4 and click Freeze Panes in the Window group. Rename the worksheet to Companies. 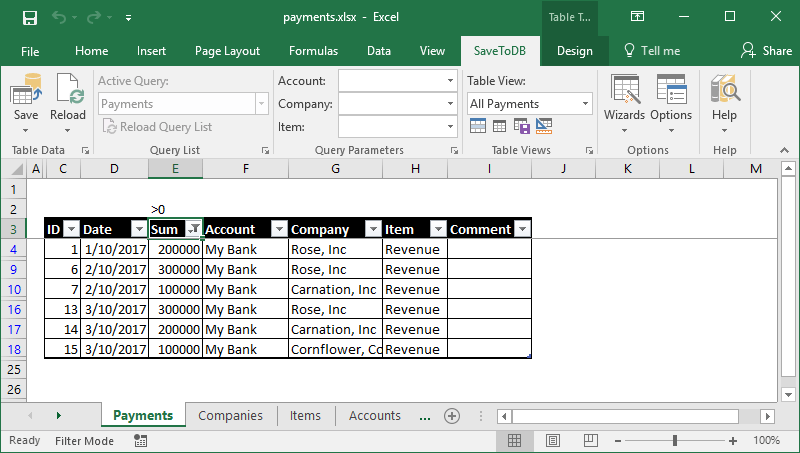 Repeat the steps for the Items and Accounts tables. Now we have the workbook that allows editing master tables. 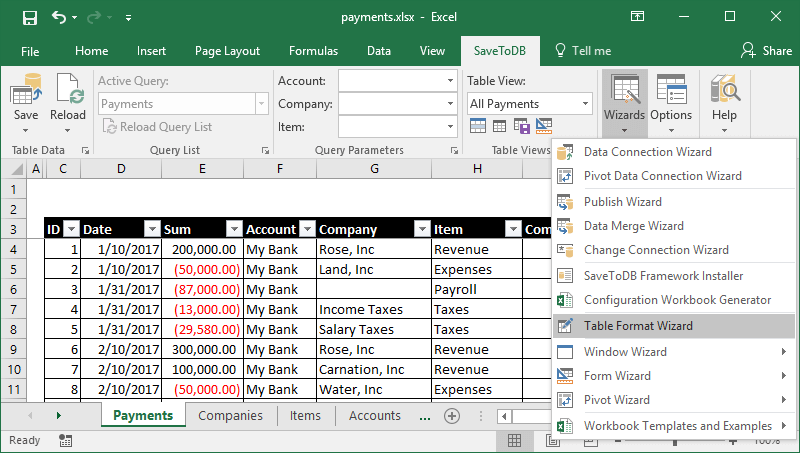 You may use Microsoft Excel as a table editor by default. 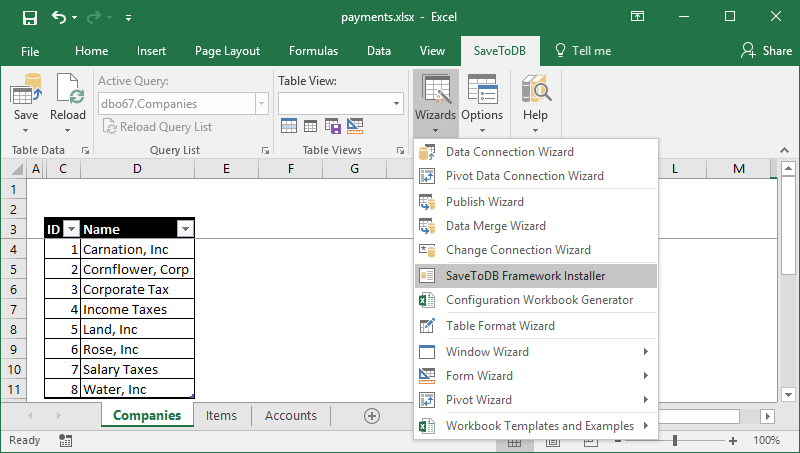 To use advanced features, we have to install the SaveToDB Framework to a database. 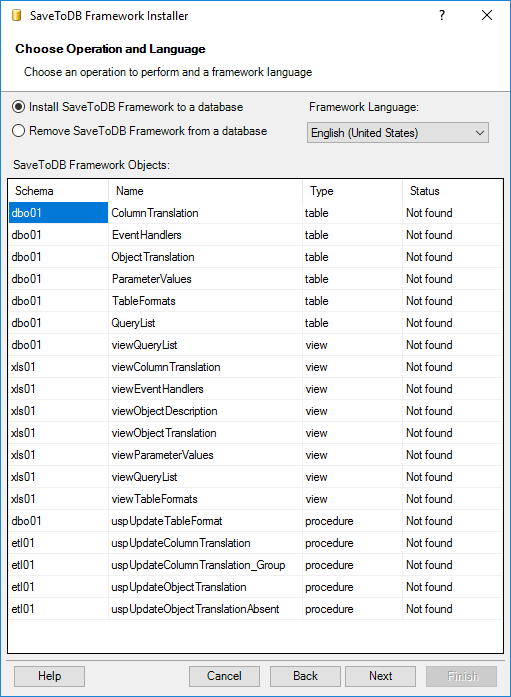 These objects allow configuring SaveToDB add-in behavior. You may remove framework objects using the same wizard. So, this is an entirely safe operation. At this step, you see the SaveToDB Framework code. Click Execute to install it. 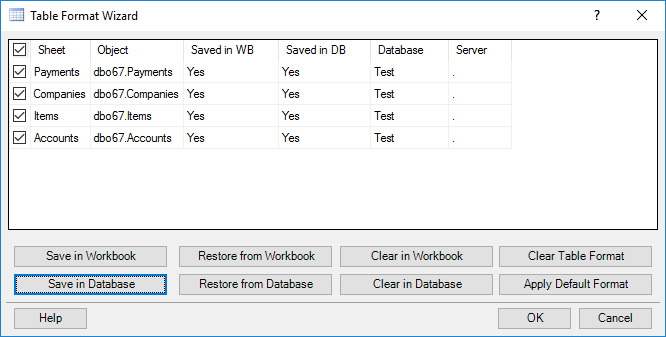 We have added SaveToDB Framework to a database. When you click Finish, the SaveToDB add-in generates a workbook. You may generate it again at any time. However, let&apos;s save it as payments-configuration.xlsx for further use. Let&apos;s add a worksheet, rename it to Payments, and connect to the Payments table. As expected, we see foreign key values. Let&apos;s change this. 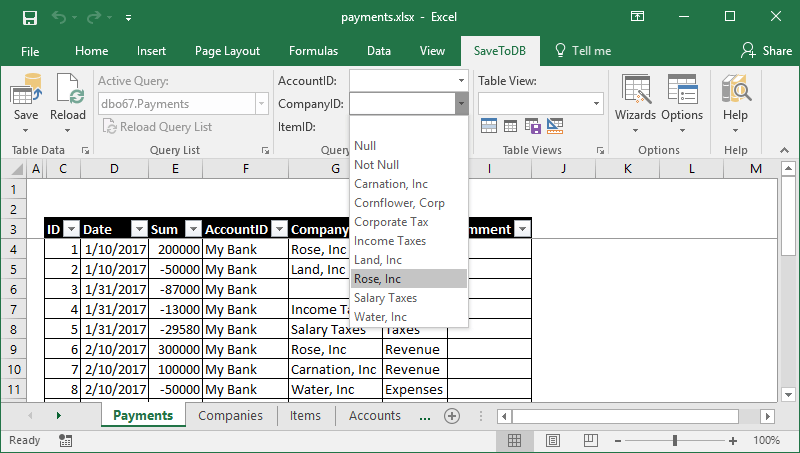 Moreover, the add-in activates the separate List Editor that allows users to select values from large lists in a comfortable way using search. 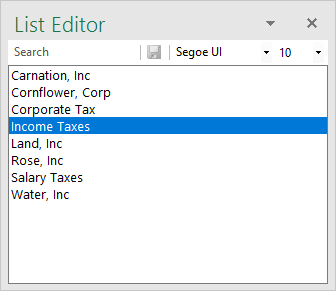 You may turn on/off the List Editor using the Options, Show List Editor Task Pane option. Let&apos;s change a couple of rows in the table and click the Save, View Save Changes SQL. As we may see, the SaveToDB add-in uses id values instead of names as it should be. This feature allows working without auto-filters and loading fewer data. The Payments table shows fields in the table and at the ribbon like AccountID, CompanyID, and ItemID. Let&apos;s change these database field names to business names. Choose the Default data language as English and click OK.
Of course, in your applications, you may use any language or even multiple languages. Click Reload, Reload Data and Configuration. 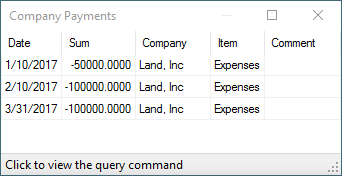 The add-in shows Account, Company, and Item instead of AccountID, CompanyID, and ItemID. You may turn off this feature in the Options dialog box as described above. We have translated field names. 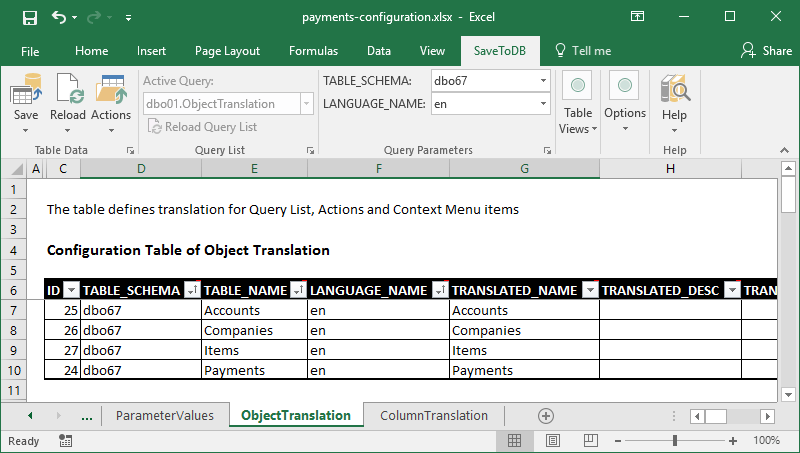 Also, we may translate database object names shown in Excel. Then return and click Reload, Reload Data and Configuration. Now we see business names everywhere. Users often apply different filters to loaded data, hide and unhide columns, sort in various ways, etc. The SaveToDB add-in may help to save such user views and even share them with colleagues. Type All Payments and click Save. 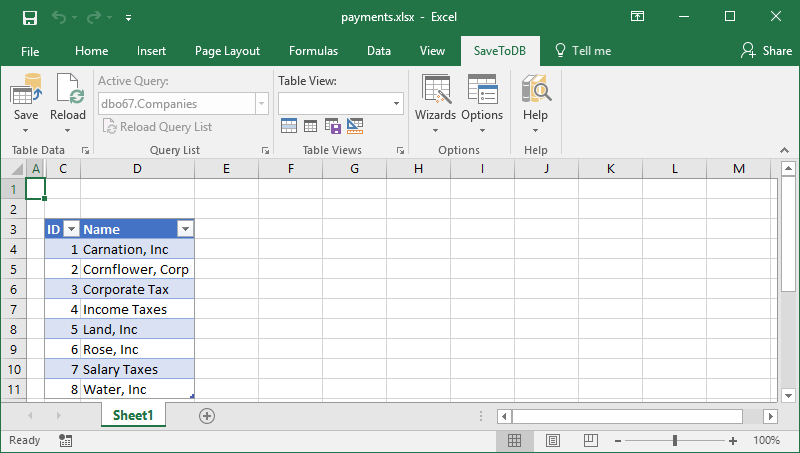 We see the name of the current view, All Payments, in the Table View field. Type >0 in cell E2. The add-in applies the filter to the Sum column. This is a reason why it is better to insert tables at cell B3. 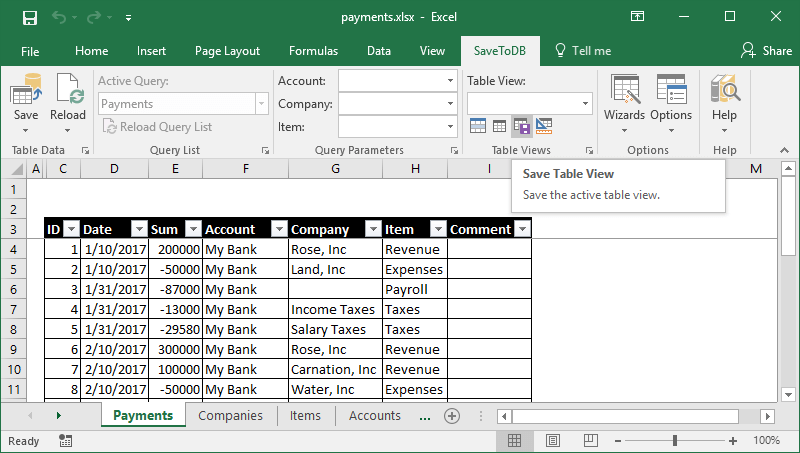 Users may use row 2 (as a row over the table) as auto-filters. Also, they may place formulas in row 1. Type <0 in cell E2. The add-in applies the new filter to the Sum column. Save the view as Expenses. As we may expect, the add-in applies the saved filter to the Sum column. I am sure, your users will be happy, and you will have fewer requests for new small database views. 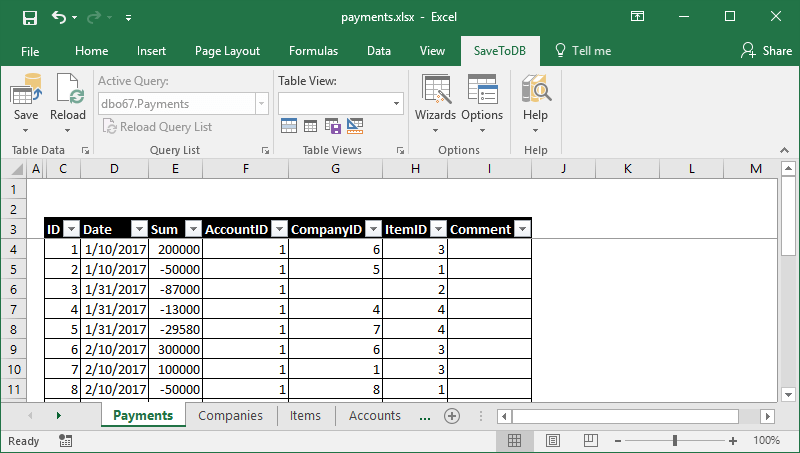 We have formatted tables and added views in the previous steps in the payments.xlsx workbook. 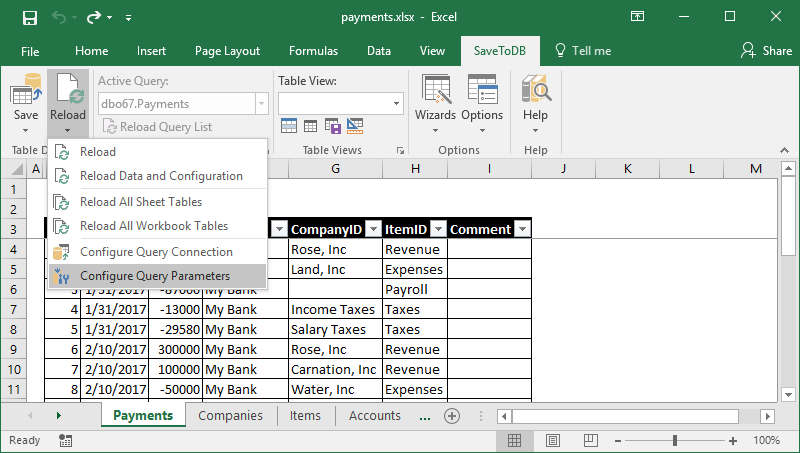 If a user connects to a database from a new workbook, he will have Excel defaults. We can fix this publishing table formats and views to a database using Table Format Wizard. 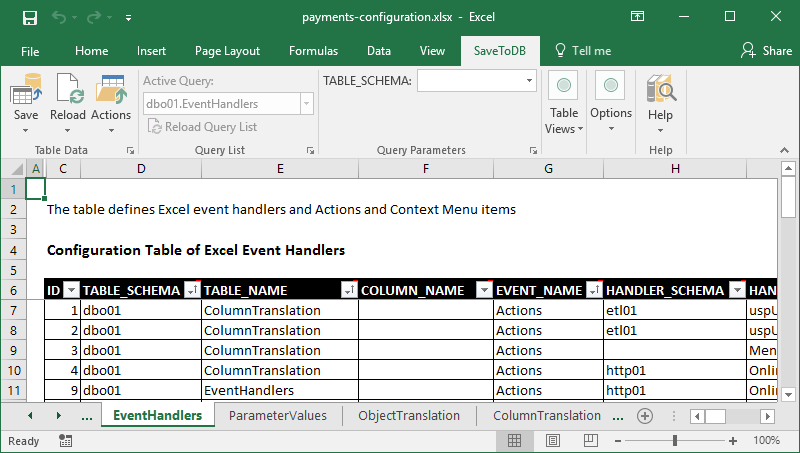 Now, users will get the same formats, views, and formulas of the tables when they connect to a database. Use the wizard to republish new views later. 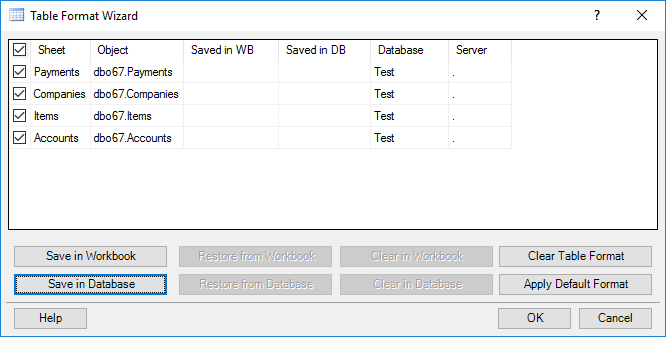 Users may use the Restore from Database button to reload the updated views. 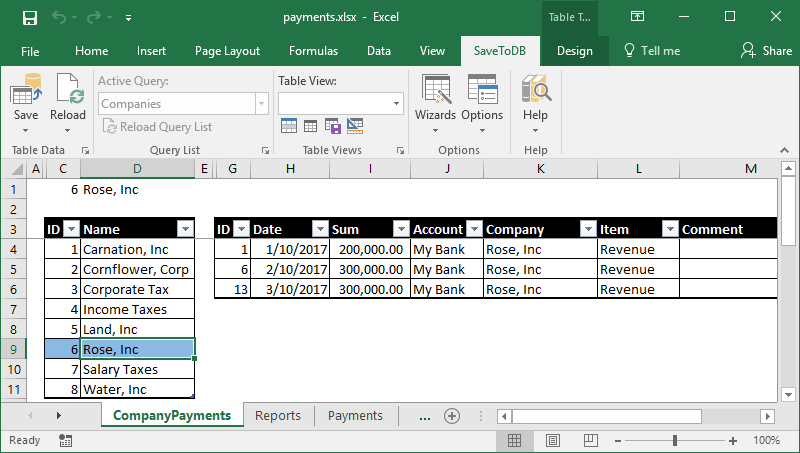 Let&apos;s create a worksheet, name it as Reports and connect to the viewPayments view. It includes much more objects and additional columns like Translated Name and Description. First of all, Translated Name and Description are shown as we added the SaveToDB Framework, added the object translation, and selected English in the Options. This feature helps users to understand database objects better. 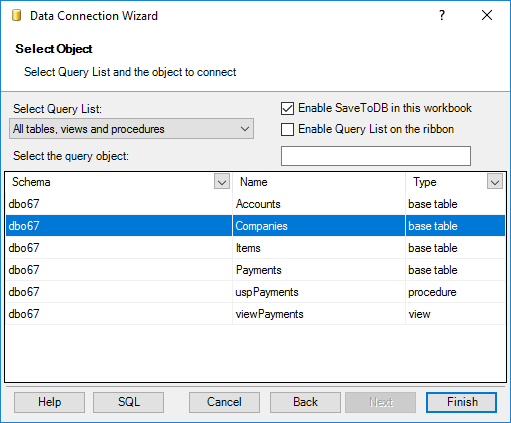 The second, the wizard shows installed SaveToDB Framework objects. You may filter objects, also. Type pay, for example. 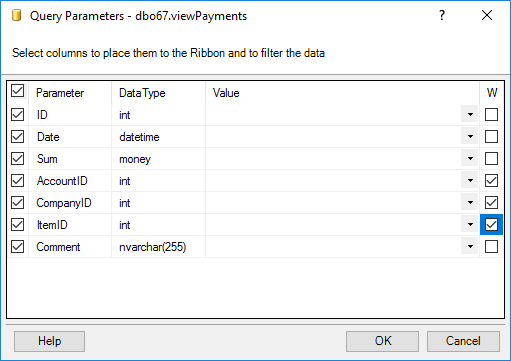 Let&apos;s select the dbo67.viewPayments view and leave Enable Query List on the ribbon checked. 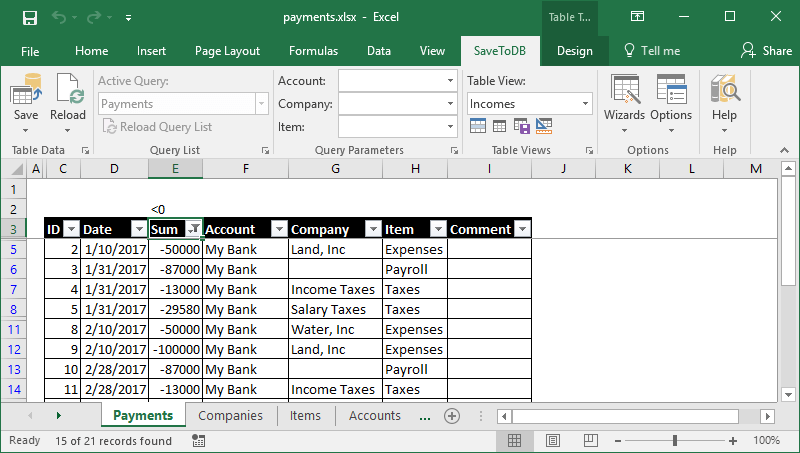 Let&apos;s check the AccountID, CompanyID, and ItemID in the W column, and insert the view at cell B3. We see a new feature. 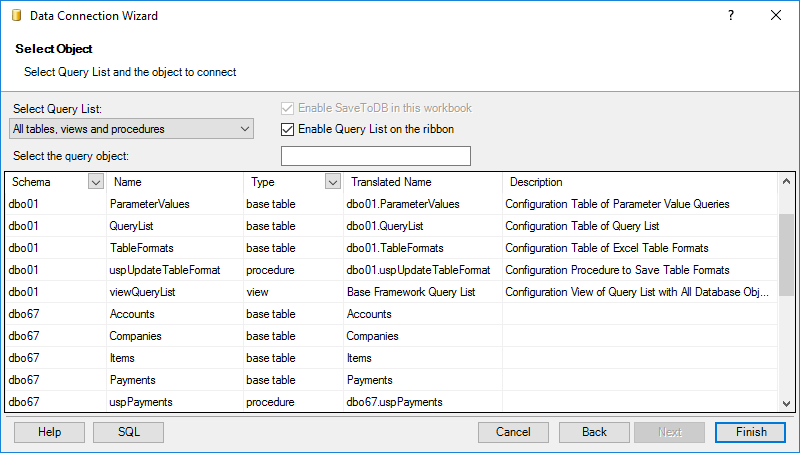 The ribbon Query List allows us to change the query. This is a very useful feature. 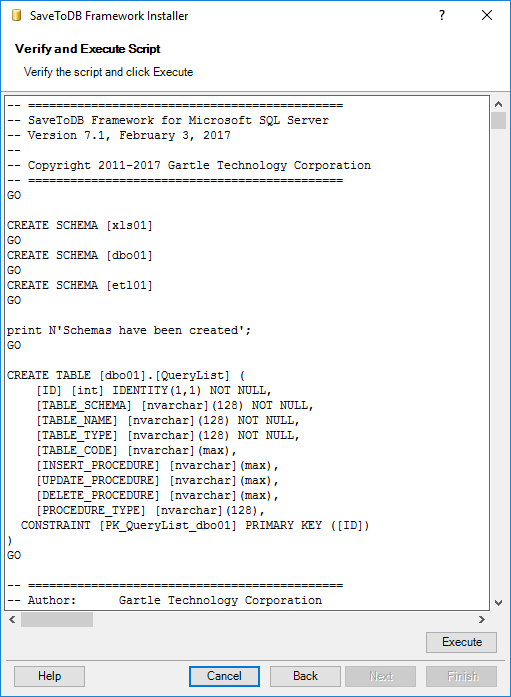 Users may use a few worksheets to work with multiple database objects. 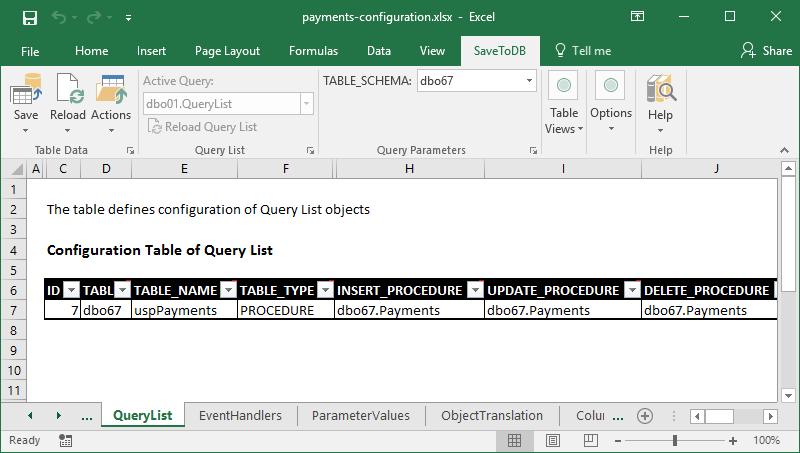 Moreover, when developers add new objects to a database, users just reload the query list and can connect. We can save changes (as the view is updateable). 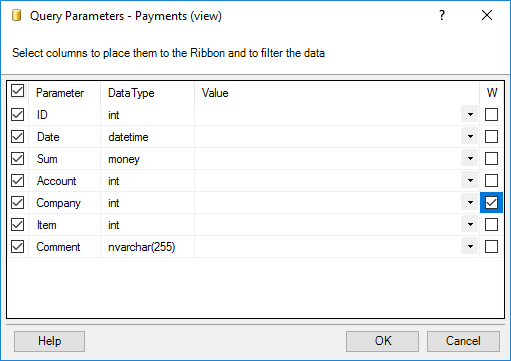 We can use ribbon parameters to filter data. We see foreign key values instead of names in columns and ribbon parameters. We see AccountID, CompanyID, and ItemID in columns and ribbon parameters. We see the dbo67.viewPayments database name in the Query List. There are no predefined table views. Let&apos;s fix the "bad news." 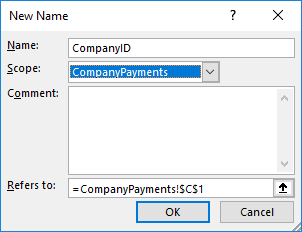 Switch to the payments-configuration workbook, select the EventHandlers worksheet, copy and paste three rows of the Payment table, and change Payments to viewPayments in the TABLE_NAME field. Click Save. It is easy. 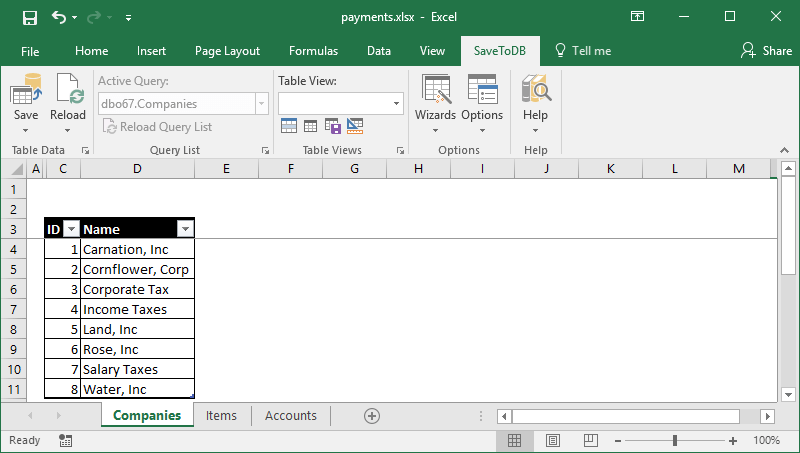 We just copied the existing Payments table configuration. 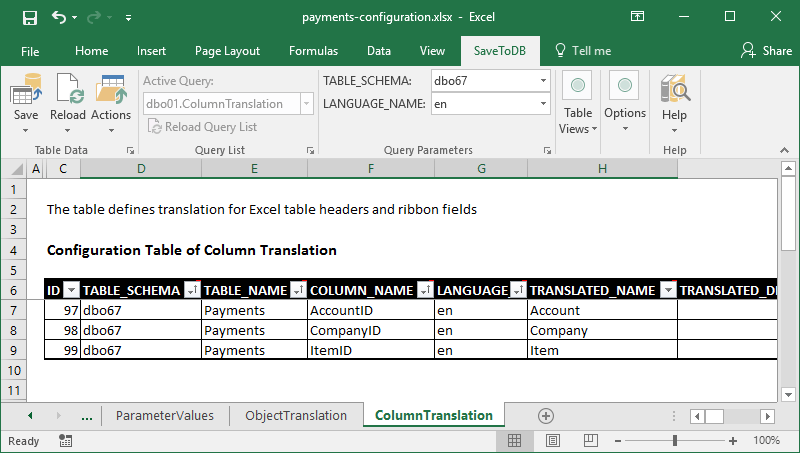 Select the ColumnTranslation worksheet, copy and paste three rows of the Payment table, and change Payments to viewPayments in the TABLE_NAME field. Click Save. 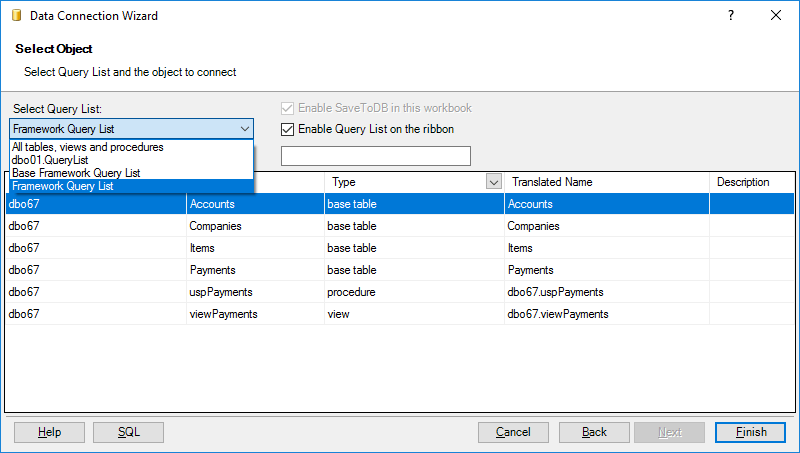 Now we can switch to the payments workbook, click the Reload, Reload Data and Configuration button, and the Reload Query List button in the Query List group. We see that we have fixed the first three points. 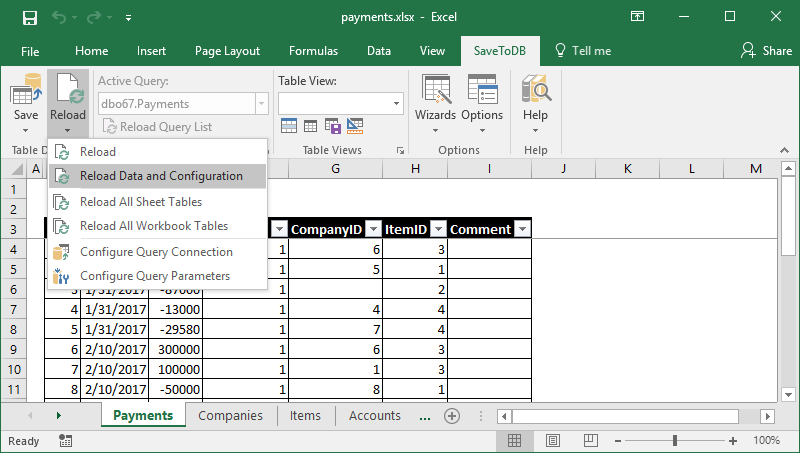 Now we can format the table, add the required table views, and save them to a database using the Table Format Wizard, as described in the previous topics. After these steps, users will get the same preconfigured and formatted view from a database. 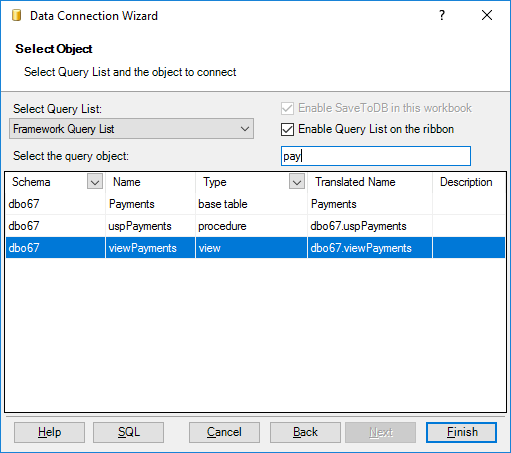 Let&apos;s select the Payments (sp) object in the Query List, a shorter way of Data Connection Wizard. The ribbon parameters have no value lists. We can&apos;t save the changes. We already know the way to solve the first group issues. The configuration is like the known EventHandlers table. 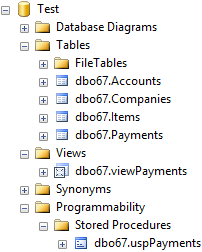 Thus, we use master tables to select ID and Name pairs for the ribbon parameters of the stored procedure. Let&apos;s discuss this in the next important chapter. In this example, this is a right case as the procedure selects data from a single table. 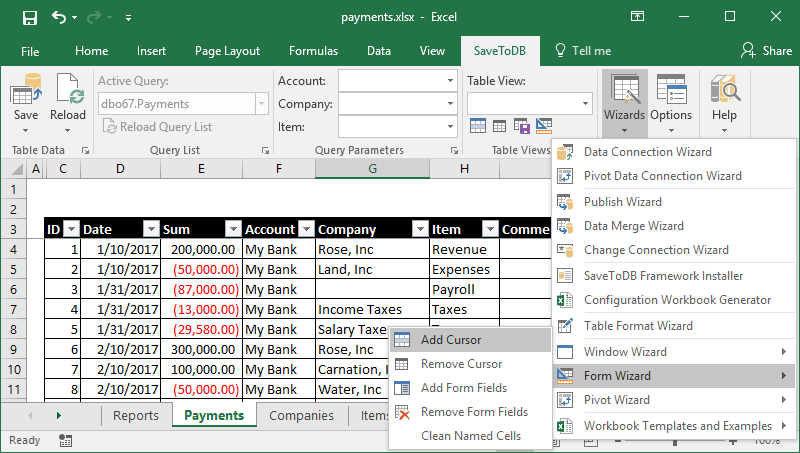 You may save changes from an Excel table to multiple database tables. However, this requires using stored procedures or SQL codes. Let&apos;s create such procedures for our example. You may see that the procedure has the parameters named as the selected column names. So, the add-in just calls the procedure passing values from a new row. You may implement any logic in stored procedures. This procedure just inserts a row into the Payments table. You may see that the logic is the same. The procedure declares and uses parameters with the column names. The update procedure has the @ID parameter as the updated row exists. The insert procedure has not. In most cases, delete procedures use primary key column values only. After these steps, we have a completely configured stored procedure. Let&apos;s change a couple of rows and check the generated SQL code using the Save, View Save Change SQL button. As we see, the add-in generated EXEC commands. If you use the _insert, _update, and _delete name convention, the add-in links edit procedures automatically, and you may skip adding the configuration to the QueryList table. 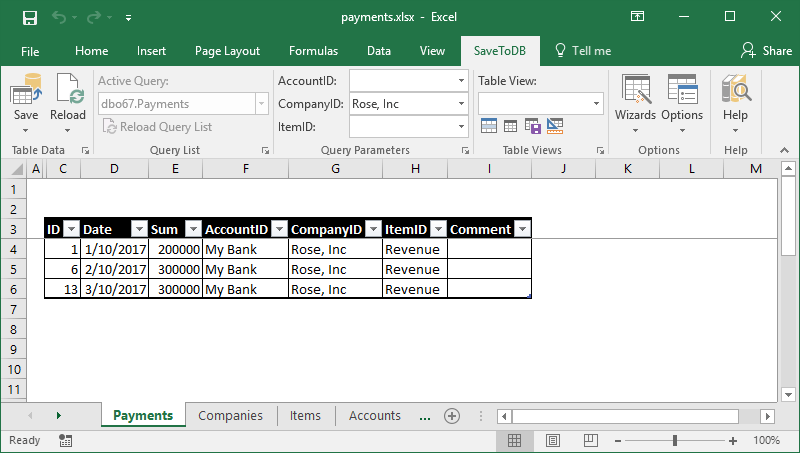 The add-in inserts form fields and updates them when a user changes the active row. 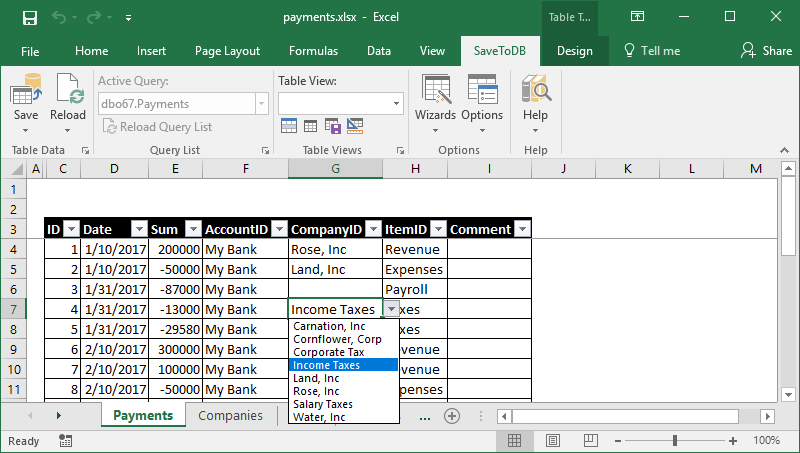 Moreover, you may use such fields to edit table row values. 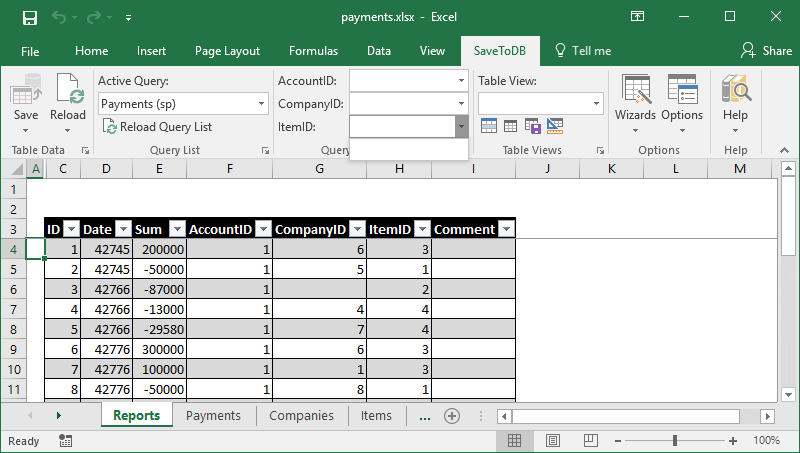 Let&apos;s create a new worksheet, rename it to CompanyPayments, and connect to the Company table at cell B3. 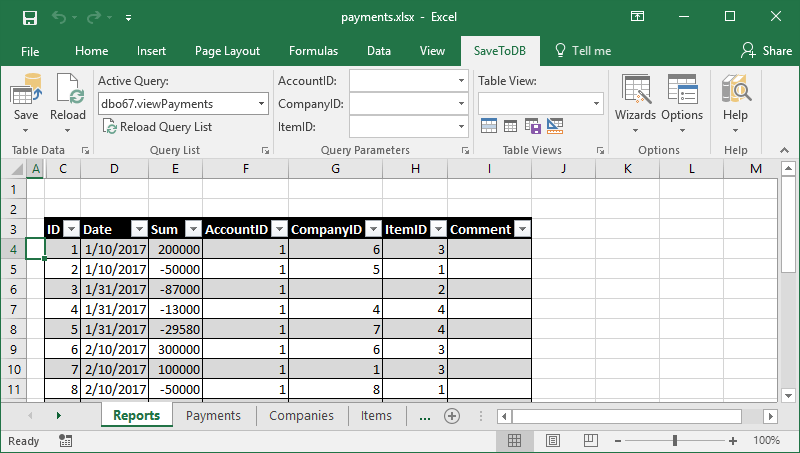 Then let&apos;s add a cursor and add form fields at cell F4. Now, select cell F3 (outside of the active table) and connect to the viewPayments view. We see that the viewPayment view has only one parameter at the ribbon, Company. Also, we see the selected company ID in cell C1 that may be used as a parameter. Let&apos;s link them. Click OK. Then select a row in the Company table, and voilà! A user selects another row in a master table. The add-in updates form fields (cell C1 with ID). The add-in changes parameters of the details view using named cell values (cell C1 as CompanyID). The add-in reloads the details with new parameter values. You may build more complex forms using the same technique. We may use another technique to show details in windows and task panes using the SelectionChange handlers. As we may suppose, the add-in executes the specified code on the SelectionChange event. 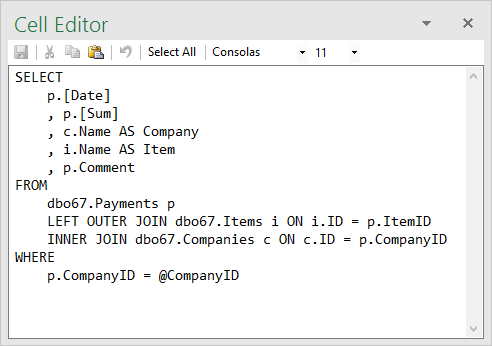 The handlers use @CompanyID and @ItemID parameters accordingly to filter output data. 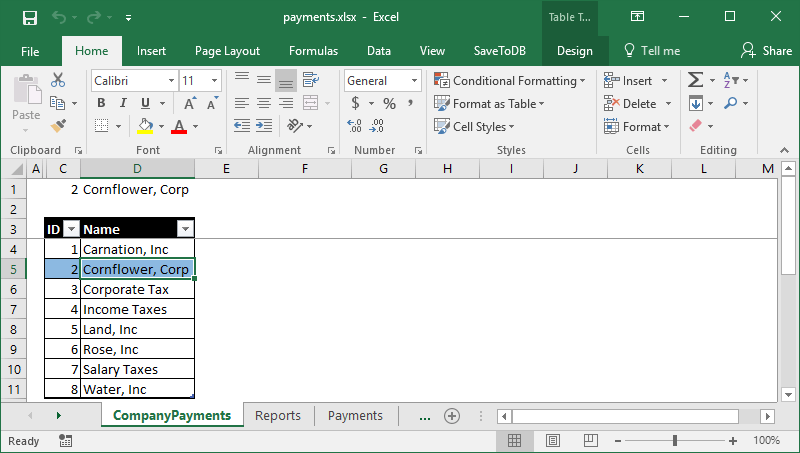 Let&apos;s switch to the payments workbook, select the Reports worksheet, and select the Payments (view) view. If the view is already activated, click Reload, Reload Data and Configuration. We may select another row. Windows will stay on top and show related information. 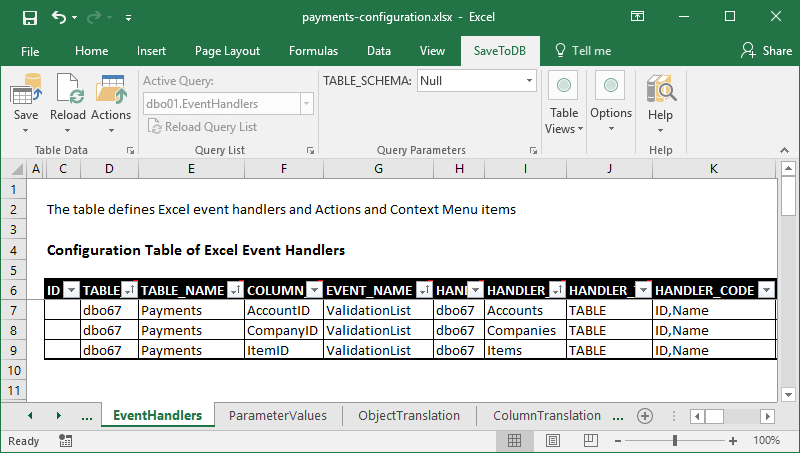 In this example, we have used the direct SQL codes stored in the EventHandlers table. This is useful when you do not want to modify your database. Otherwise, you may use stored procedures with parameters. 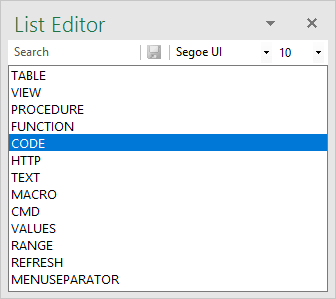 The SaveToDB add-in adds great support for editing codes in cells. You may edit the text in the editor and click the Save button to update the underlying cell. You may turn on/off the editor using the Options, Show Cell Editor Task Pane option. Use of detail windows is a good solution when you need windows that are always visible. If you need context windows, you may use task panes. 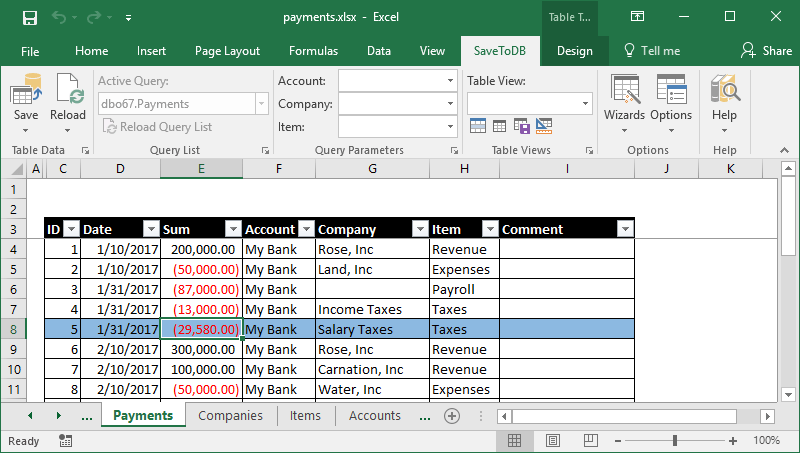 I have copied the view rows, changed the view name, and added _TaskPane to the TARGET_WORKSHEET field. The HANDLER_CODE codes remain the same. 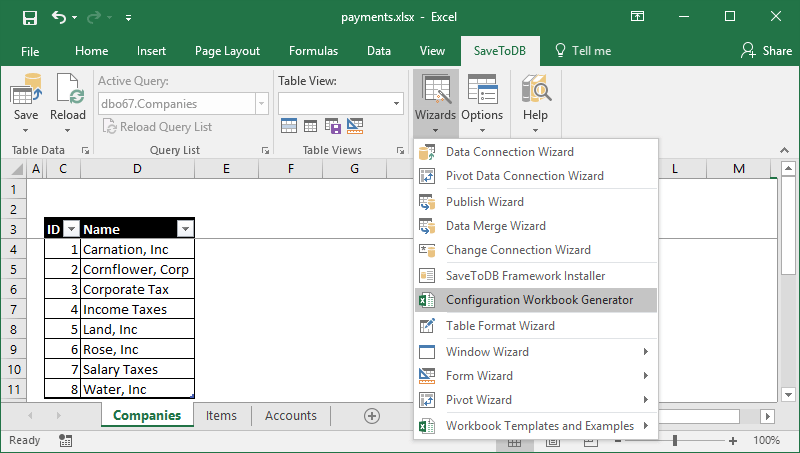 Let&apos;s switch to the payments workbook, and change the query to the Payments (sp) procedure. Also, users may dock task panes and turn them on/off using the Options, Show Task Panes option. Detail windows and task panes discussed above are shown in the SelectionChange event. We may add such queries and much more to the context menu. As we learned above, the SelectionChange and ContextMenu handlers are nearly the same. They get parameters from the columns of the active row. They differ by the EVENT_NAME configuration. 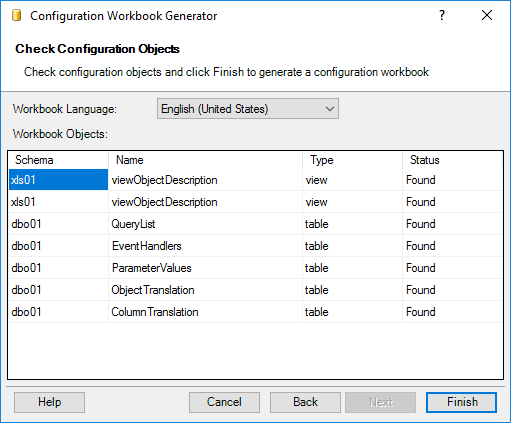 You may configure executing stored procedures, SQL codes, macros, CMD commands, opening URLs. Use the MenuSeparator type to separate menu items. The action menus are located at the ribbon and have nearly the same features as context menus. 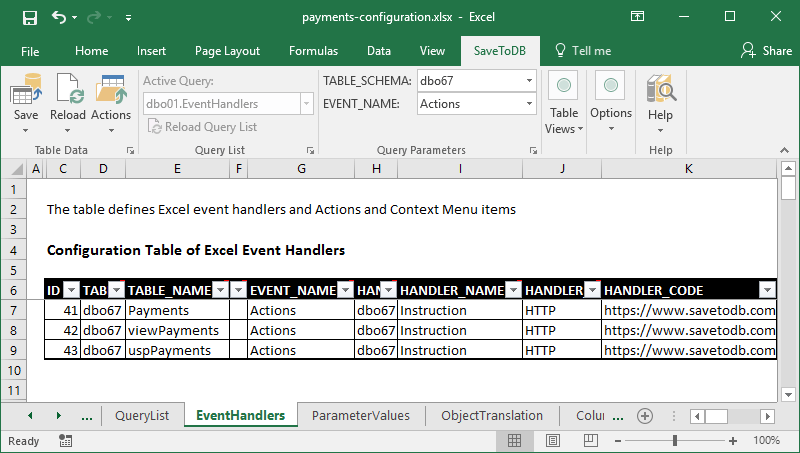 However, users may execute actions when the active cell is outside of the table. So, they may have no context. 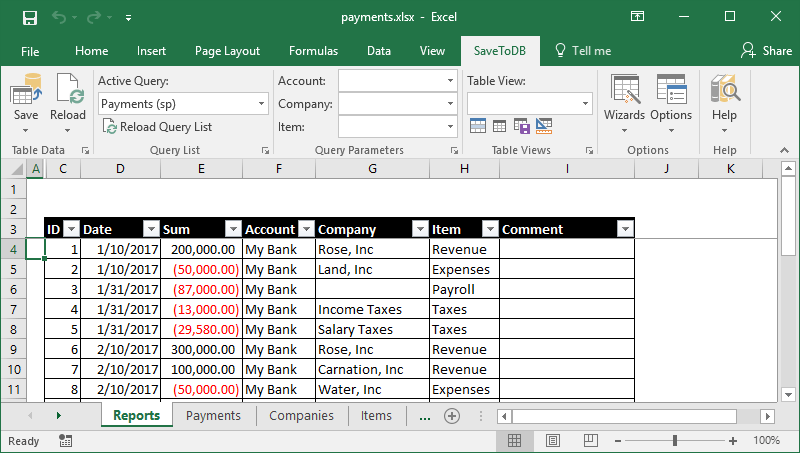 We have created a complete client application using Microsoft Excel. Now you may create such applications yourself. You may create databases and client applications using your database developer skills. 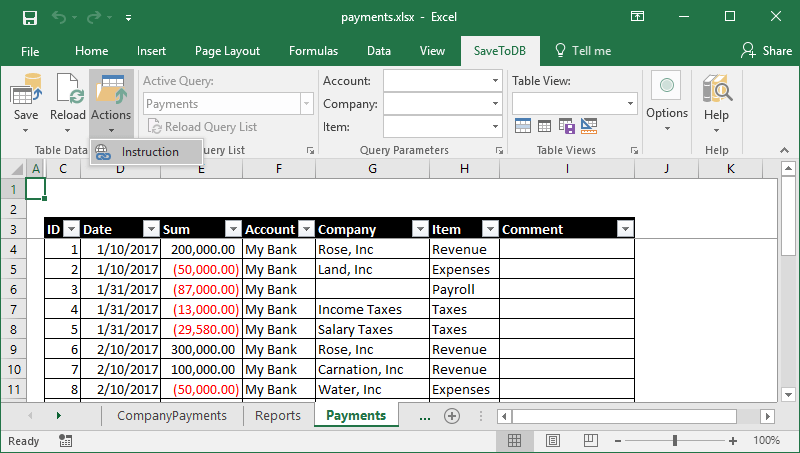 You create client applications that have all the features of Microsoft Excel. You may add features step-by-step. You have no headache with deployment and updates. 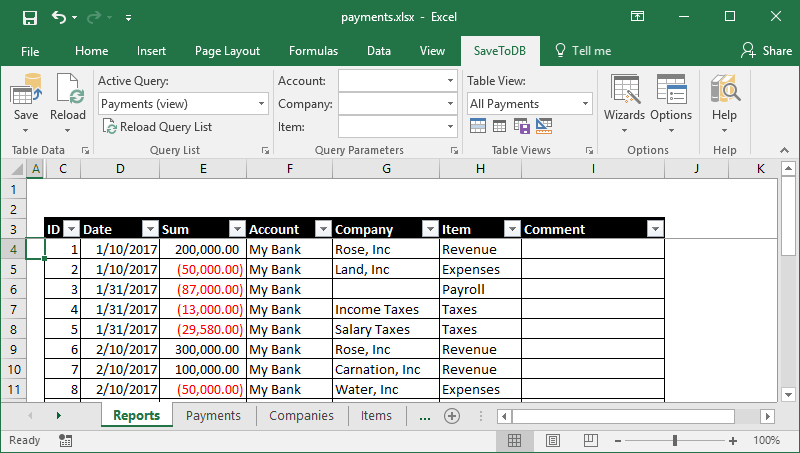 Users are happy as they use Microsoft Excel, the app with the best features and user experience. Users are happy as they use personal, not shared, workbooks and do not depend on others. Your company may solve tasks creating applications with lower risks and lower costs in a shorter time. This book contains an example database for Microsoft SQL Server. You may also use Oracle Database, IBM DB2, MySQL, MariaDB, PostgreSQL, NuoDB, or SQLite. You may download the SaveToDB add-in at www.savetodb.com. I would appreciate your feedback. Feel free to contact me at . To use all described features, install version SaveToDB 7.2 or higher. Add UNIQUE constraints to your tables to avoid name doubles. The view selects data from a single table that makes it updateable. You may use INSERT, UPDATE, and DELETE statements for such views directly. The add-in uses this feature. 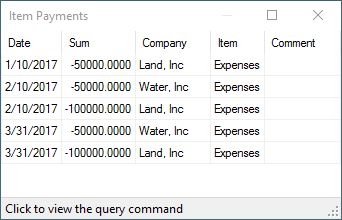 The stored procedure has parameters used to filter source table data. The NULL value means "all values." Use SET NOCOUNT ON as the first command. Otherwise, Excel cannot load data from the procedure.